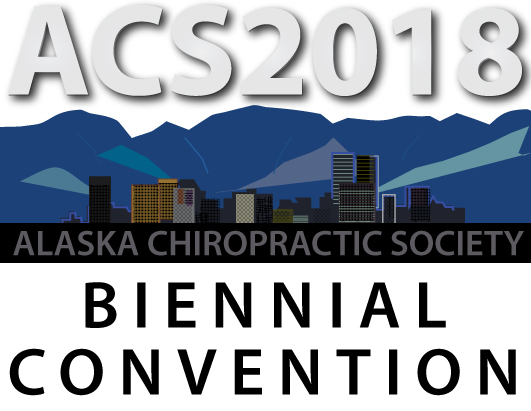 The 2018 Fall Alaska Chiropractic Society General Membership meeting will be held on Thursday, October 4th from 6:00 pm - 8:30 pm in Club Room 2 (Tower 1, 10th Floor) at the Hotel Captain Cook located at 939 W. 5th Street, Anchorage, AK as part of the ACS 2018 Convention. Dr. Jay Greenstein, Chairman of the Clinical Compass (CCGPP) and Dr. John LaMonica, Past-President for ChiroCongress, will be our featured speakers and present an update on national concerns and initiatives facing all chiropractors across the nation. ACS will not be conducting Board Elections this year as the current Executive Board is running unopposed. Acceptance/installation of Officers will be conducted at the General Membership Meeting on Thursday, October 4th. PLEASE READ! - Agenda item for the General Membership Meeting - members will discuss proposed changes to the ACS Bylaws and Articles of Incorporation (click on links to access proposed changes). These Bylaw and AOI changes are necessary in order to provide a vehicle for the Alaska Chiropractic Society to support Members with the requirement of certification of Chiropractic Clinical Assistants. The proposed state regulations outlining the requirement deadlines and process for certifying Chiropractic Clinical Assistants in Alaska (SB69 August, 2016) are anticipated to be out by end of this year with enactment anticipated by Spring, 2019. All ACS Members - and prospective members - are invited to attend! The Ground Breaking Bash hosted by Dr. Jim Martin, ACA Alaska State Delegate will immediately follow the membership meeting in the Quarter Deck of the Hotel Captain Cook. Come join us for cocktails and appetizers and socialize! Questions? Contact ACS at 907.903.1350 or sryan@akchiro.org.